WASHINGTON, May 1. /TASS/. 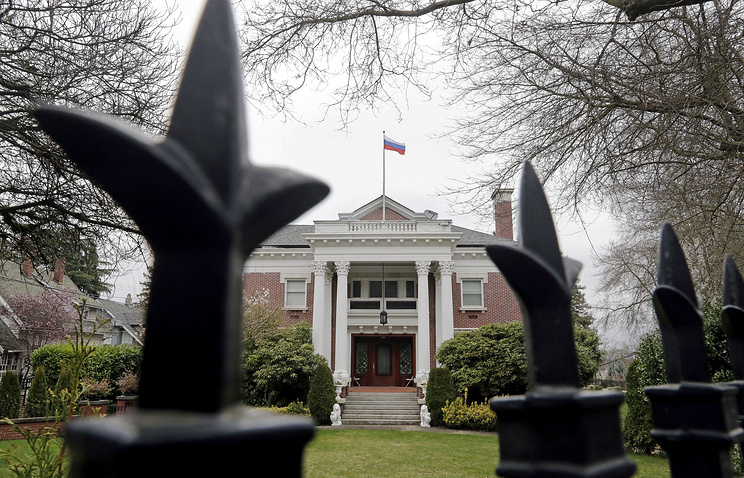 The US authorities have removed the Russian flag from the building of Consul General’s residence in Seattle, Russia’s embassy in Washington said Monday, adding that the move is illegal and the flag should be placed back. "Today under the cloak of night the US authorities removed the state flag of the Russian Federation from the residence of Russia’s Consul General," the embassy said. "Those illegal actions" against the Russian national symbol are unacceptable and are viewed as "another example of gross breach of international law by Washington," the diplomatic mission emphasized. "Let the US authorities remember that the residence of Consul General is the property of the Russian Federation, which is inviolable. In this respect, we demand an immediate return of our national flag to its legally compliant place - on the flag-post over the building of the residency," Russia’s embassy said, adding that it also insists on "returning all illegally captured Russian diplomatic property in the cities of Washington, San Francisco, Seattle, the states of New York City and Maryland." In September 2017, the Donald Trump administration closed the Russian Consulate General in San Francisco, the Russian trade mission in Washington and its branch in New York. The consulate and trade mission are Russia’s state property and have diplomatic immunity. In late March 2018, the US administration announced it was expelling 48 Russian diplomats and 12 diplomats from Russia’s permanent mission to the UN in New York. It also closed the Russian consulate in Seattle.